As you all know, OnePlus is going release their "flagship killer" as OnePlus 5 and they are very good at making the hype because recently they have announced that they are partnering up with DxOMark to bring a better camera experience. Today, OnePlus might have teased which colors you’ll be able to buy its 2017 flagship in. Releasing a device in a number of colors? It’s not OnePlus’ style, but that could change this year. The OnePlus 5 could be sold in black, blue, purple, teal, red, and gold. Or we’re totally looking too far into a tweet sent out by the company on Monday and the phone will be offered in one or two colors like usual. 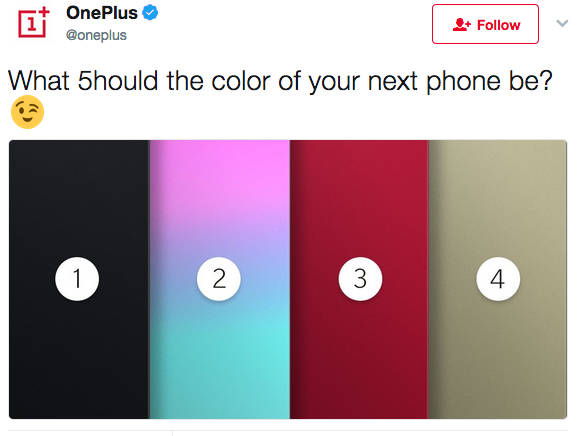 The tweet asks, “What 5hould the color of your next phone be?” along with an image showing four colors. Notice that, in the text, the number five is used instead of a letter. Clearly OnePlus is referring to the OnePlus 5 in some way. The assumption around the web is that we’re getting a look at the colors the phone will be offered in. Earlier this month, OnePlus confirmed its 2017 flagship would be announced during the summer months. Currently it’s expected that the OnePlus 5 will debut in June. While we don’t know anything for sure right now, that seems accurate as most of the company’s previous devices were launched in the same season. So, like last year, June is probably the month we get to see OnePlus’ next phone.